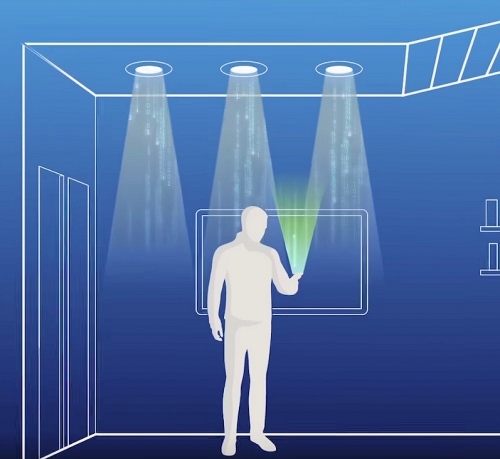 A developer of the new Visible Light Communication (VLC) based networking technologies, pureLiFi, has announced that they’re about to demonstrate the first “consumer ready” Gigabit speed Light Fidelity (LiFi) kit. The new technology has also been miniaturised so that it can fit inside of a Smartphone. Early VLC networks essentially turn Light-Emitting Diode (LED) based light bulbs into a sophisticated wireless data network (like Infrared). This is achieved by turning the bulb(s) on and off many times a second (most of them already do this to save power) and by altering the length of these “flickers“, as well as other properties of the light, you can introduce a digital communication (e.g. think of Morse Code with a torch). At present most of the early indoor VLC networks have been aimed at office environments and tend to deliver speeds of around 40Mbps to 250Mbps (depending upon the setup and number of bulbs etc.). One of the reasons for that is because the market has been dominated by proprietary standards, although the ITU’s new G.9991 (G.vlc) standard is in the process of changing that (here). Furthermore, an international group of industry experts from companies across the Wi-Fi ecosystem (Intel, TI, Quantenna, Cisco and HPE etc.) have come together to develop the standard for Light Communications based on the globally successful Wi-Fi standard (IEEE 802.11). A LiFi standard called 802.11bb is set for release in 2021. “The ecosystem is crying out for new spectrum and new wireless technology that will service the global appetite for more bandwidth and digital innovation. Device manufacturers need new technology to be sure they’re ready for 5G and differentiate between their competition. According to Alistair, LiFi can deliver “1000 the bandwidth of traditional wireless” networks and offers ultra-low latency solutions, as well as having an ability to service “more users per square metre than any other wireless technology on the market.” However those statements are largely based on lab tests (theoretical) and such performance has yet to be proven in a real-world home environment with final hardware. The advantage of VLC is that it could remove some of the capacity strain from existing wireless networks and would be more secure (you can still intercept the signal but it’s trickier to do than WiFi). On the other hand VLC is currently more of a complement than a replacement for WiFi, particularly as spreading the service around your home would be difficult / expensive without replacing the bulbs in every single room. The other question mark is over how much extra electricity such bulbs would consume, as well as whether or not consumers might find themselves in the odd situation of needing to leave their lights switched-on during the daytime in order to benefit (note: they can be dimmed down to c.10% brightness and still work). Suffice to say that it’s still early days for LiFi but we’re intrigued to see what solutions may emerge as the technology matures. pureLiFi will present the first consumer device powered by Gigabit LiFi at Mobile World Congress (MWC). Only any good for those with a clear desk policy. If it was my desk the phone will probably under something when that important call/text is sent to me. Good technology for fixed devices (PCs/Telephones) but not sure its appropriateness for Smart phones which will be primarily 5G and WIFI indoors, both working while it is in your pocket/bag.